Caption slip reads: "Photographer: Richardson. Date: 1951-10-24. Reporter: Swaim. Assignment: Golden wedding, El Monte. 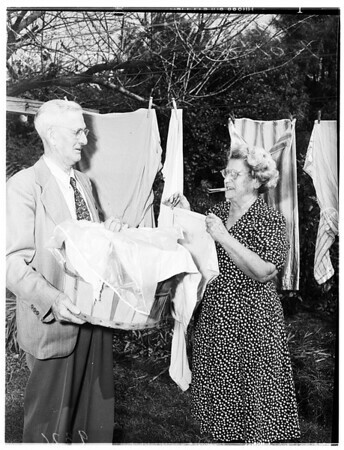 K19, 29: Lawrence L. Hale, 70, holding basket while Mrs. Edith Hale, 70, hangs up his shirts after washing them on 50th wedding anniversary. K15, 16: Lawrence L. Hale and Mrs. Edith hale, both 70, relaxing in lawn swing on 50th anniversary".